The oil and gas industry relies on midstream companies with the infrastructure to transport large volumes of products. Houston based Kinder Morgan Inc. and its subsidiaries make up the largest midstream infrastructure company in North America with approximate 80,000 miles of pipelines and 180 terminals. 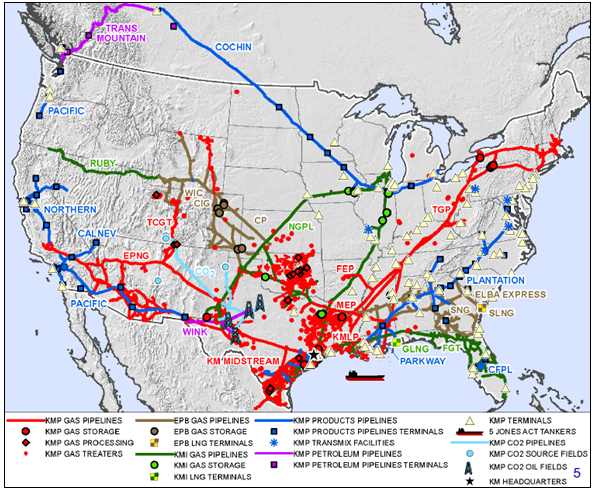 The pipelines transport crude oil, natural gas, refined petroleum products, carbon dioxide and other products. The terminals store or handle a variety of products including gasoline, jet fuel, ethanol, coal, petroleum coke and steel. For the most part midstream companies receive a fee for transporting the products. By not taking ownership in the commodities being transported, they are largely insulated from the volatility of commodity prices. 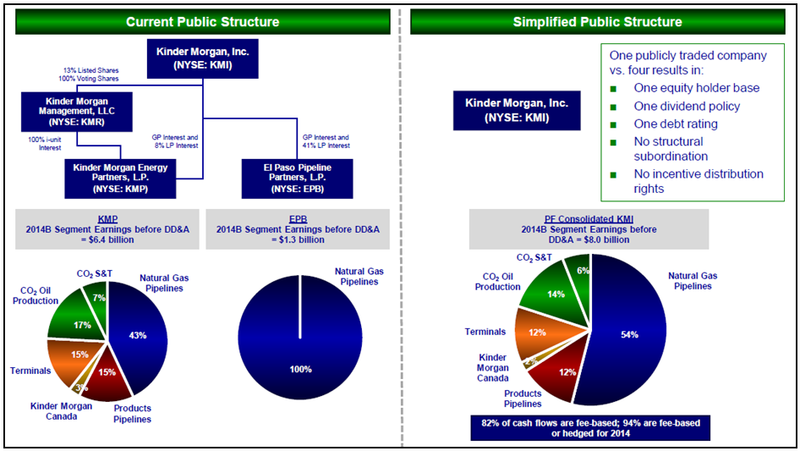 In 2014 for example approximately 82% of the cash flows at Kinder Morgan are fee based. About 67% of the remaining non-fee cash flow is hedged for a total 94% of cash flows insulated from commodity price exposure. The fee for service business is often compared to a toll road because provides Kinder Morgan and other midstream companies with cash flow stability. On August 10, 2014 Kinder Morgan’s management announced [Source] it would merge the parent company Kinder Morgan Inc. (KMI) with three entities under its control. The merger is expected to provide additional cash flow for dividend growth and lower the cost of capital to facilitate KMI’s participation in the North American oil and gas renaissance driven by unconventional oil and gas activity. As a result midstream infrastructure needs are rapidly increasing and the merger is expected to help KMI’s growth in this “target rich environment” according to CEO Rich Kinder. The valuation is supported by a large footprint of hard to duplicate infrastructure assets with a wide protective moat and near monopoly status. Other attractive characteristics include: an industry facing unprecedented growth; relatively inelastic demand for its essential services; shareholder friendly management; a record of proven performance and stable cash flows. The valuation shows attractive 80-130% returns may be realized in the 3-5 year investment horizon or a potential average annual return of about 26%, while enjoying a significant margin of safety. Kinder Morgan Inc. (KMI) will merge with the three entities under its control: Kinder Morgan Management LLC (KMR); Kinder Morgan Energy Partners (KMP); and El Paso Pipeline Partners (EPB). It is anticipated the entities will be consolidated into Kinder Morgan Inc. Corporation by year end 2014. KMI will pay a total of $71 billion to complete the transaction. The unit holders of the partnerships (KMP & EPB) and shareholders of the KMR Corporation will receive KMI shares and cash. On completion the merged Kinder Morgan Inc. will remain the largest midstream company and form the third largest energy company in North America. The combined enterprise value is approximately $140 billion. Assets costly to construct with long lives providing a vital service. Demand tends to be inelastic given the scarcity of the resources being offered. Monopolistic pricing power often regulated with long term stable cash flows. A mix of both fixed income like cash flows with potential capital gains. Assets that tend to appreciate or can be expanded; allowing for value to grow over time. Investments range from low-risk regulated assets to moderate risk loosely regulated assets. Varying amounts of inflation and volume protection with varied levels of vulnerability to economic cycles. Globally infrastructure assets represent a mix of both public and private facilities necessary for economic activity. They provide essential products and services for the modern global economy. In addition to midstream oil and gas assets examples include power generation and transmission, water supplies and treatment, rail, roads, bridges, tunnels, ports and airports. Investor interest in infrastructure assets increased in recent years due to global population and economic growth and the much needed spending on infrastructure. Current estimates of global infrastructure spending range considerably; a survey of 300 senior infrastructure professionals showed infrastructure investments between $34 and $60 trillion through 2030 according to Infrastructure Investor [Source]. The need for pipelines in North American is increasing as improved technology expands production in U.S. shale rock formations and Canada’s oil sands. The United States is now the largest natural gas producer and could overtake Saudi Arabia as the world’s largest supplier of hydrocarbons by 2020. As it becomes largely self-sufficient in oil and gas this changes decades of dependence on imported energy sources. In the past waterborne imported supplies were transported by midstream companies to the mid-continent. Infrastructure is will now needed to transport supplies from the new mid-continent supply locations to the Gulf Coast refinery centers and the ports for export if forecasts prove to be true. IHS forecasts oil and gas infrastructure investment over the next 12 years (2014 – 2025) will be $890 billion, with crude oil and natural gas gathering systems and other midstream facilities (the Kinder Morgan businesses) at 60% of total or about $530 billion. A sensitivity case assuming a 20 percent oil and gas production increase over the base case, increases equivalent investment to about $690 billion over the 2014-2025 period. To put this into perspective, the industry’s total capitalization will grow from about $875 billion to $1.4-1.6 trillion over the next 12 years, almost a doubling of the industry size. The Interstate Natural Gas Association of America Foundation (INGAA) in a report prepared by ICF International [Source] and cited by Kinder Morgan further supports this forecast with total capital expenditures estimates in North America for natural gas, natural gas liquids, and crude oil at $464 billion in the low case and $641 billion for their base growth case through 2035. These estimates and the timing will be continually revised as the story unfolds. However, even after applying a margin for error; the magnitude of these numbers make a compelling case for the growth potential of energy infrastructure companies and its largest participant, Kinder Morgan. This large footprint will enable Kinder Morgan in certain cases to generate growth projects at lower costs than competitors who may need to build out new assets where KMI is already present. Incremental investment economics can be more attractive when expanding from existing facilities, right of ways, and with corporate support already in place. Companies with large footprints will likely have more opportunity for internal growth and favorable returns as existing capabilities become increasingly important. In addition to expansion projects there are about 120 other publicly traded midstream companies with a combined enterprise value of $875 billion that are candidates to be acquired. Add this to the $530-690 billion new investment needed in the INS forecast results in a potential growth opportunity of $1.4-1.5 trillion for Kinder Morgan over the next decade. This is equivalent to ten times Kinder Morgan’s current enterprise value ($140 billion) providing plenty of room to grow even for the largest company. Management’s anticipated investment grade credit rating for Kinder Morgan after the merger and their demonstrated ability to raise capital in both good and bad markets should provide good access to capital for both new construction and acquisitions. One of the primary reasons for the announced consolidation is to lower the cost of capital and provide currency to compete more effectively for growth opportunities and acquisitions in this “a target rich environment”. The Master Limited Partner (MLP) structure of Kinder Morgan’s subsidiaries previously facilitated Kinder Morgan’s growth by providing low cost equity capital from income oriented investors. Ironically their success and the MLP structure is now hindering that growth. The Incentive Distribution Rights (IDRs) paid by the subsidiary KMP to the parent KMI consumes about 46% of the subsidiary’s distributable cash flow increasing the cost of capital at KMP partnership almost two fold. You can learn more about how IDRs impact the MLPs through two good papers: Credit Suisse Master Limited Partnership Primer-Part Deux [Source] and Morgan Stanley’s Midstream Energy MLPs Primer 3.0 [Source]. In Kinder Morgan’s 2014 Analyst Conference appendix [Source] Kinder Morgan estimated the IDRs increase the equity cost of capital from 6.7% to 12.5% at KMP and 7.2% to 10.1% at EPB. This cost of capital disadvantage is offsetting the advantage of Kinder Morgan’s extensive size and outstanding management to the extent it reduces investment opportunities and growth because the distribution increases expected by the income oriented equity investors suffer. With the current need for investments and opportunity for acquisitions in the midstream sector, lowering the cost of capital couldn’t come at a better time. As part of the Kinder Morgan news release on the merger [Source] the company announce a significant dividend increase: “All shareholders and unit holders of the Kinder Morgan family of companies will benefit as a result of this combination. Everyone will hold a single, publicly traded security – KMI – which will have a projected dividend of $2.00 in 2015, a 16 percent increase over the anticipated 2014 dividend of $1.72. We expect to grow the dividend by approximately 10 percent each year from 2015 through 2020, with excess coverage anticipated to be greater than $2 billion over that same period.” Further good news later in the presentation was that the 10% annual growth rate expected for at least the next 5 years (2015-2020) is “before taking into account a larger opportunity set driven by a lower cost of capital”. Kinder Morgan describes itself as a company “run by shareholders for shareholders”. Rich Kinder earns a salary of $1 per year, receives no bonus, stock options or restricted stock grants. He along with other management and the original stockholders own about 29% of KMI stock. Their personal wealth is invested alongside us public shareholders assuring our interests remain aligned. Chairman and CEO Rich Kinder and college friend William Morgan founded Kinder Morgan with the purchase of Enron Liquids Pipeline for $40 million in 1996. The company grew significantly to become the largest midstream energy pipeline company in North American ($140 billion enterprise value) through excellent capital allocation and returns to investors. These solid total compounded returns over the years is illustrated below attesting to management’s capital allocation skills that provided growth and return for investors. Management’s open and honest communication style is not only a reasonable expectation of shareholders, the owners of the company, but a requirement to meet the trust inherent in the board of directors’ fiduciary duty to shareholders. In KMI’s presentation on the proposed consolidation an interesting slide in the appendix entitled Financial Rigor: Promises Made, Promised Kept shows that of the 19 budgeted dividend increases over the years (promise made), 18 of them were met (promise kept). Actions speak louder than words and the message seems clear: we have and will continue to do what we say. Kinder Morgan Inc., estimates the depreciation as a result of the merger will save about $20 billion in taxes over the next 14 years. Another benefit of the announced consolidation is it simplifies the complicated structure of the Kinder Morgan Companies into one “C” corporation with an estimated $20 million/year benefit. For the most part Kinder Morgan enjoys a wide economic moat with inflation adjusted tariffs that provide some protection against reduced demand. However, they do operate a carbon dioxide pipeline to flood Permian basin oilfields for enhanced oil recovery where they control the source and transportation of the carbon dioxide and the resultant oil production. The company estimates up to 18% of their cash flow is exposed to commodity price fluctuations but a hedging strategy is use to lock the in economics and help mitigate this exposure. For example, 94% of their cash flow in 2014 is either fee based or hedged. 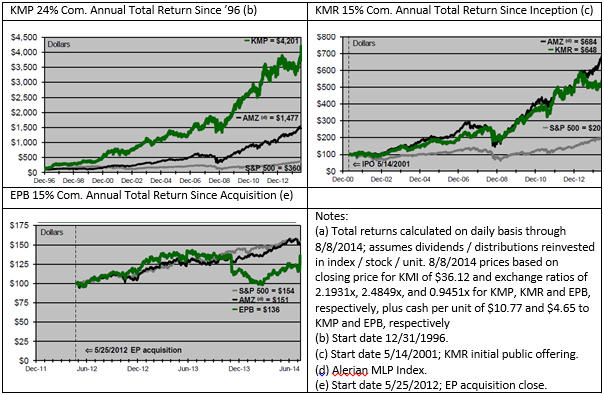 KMI’s total return will be realized from both income as dividend yield and growth as share price appreciation. Management’s guidance on the dividend over the next several years is explicit. As a major player with a protective moat in an industry forecasted to almost double in size over the next ten years growth is expected to be a major component. Low Yield Case (3.6% Yield): Consisting of two midstream peers & nine S&P 500 dividend companies used in the KMI Consolidation Presentation. The S&P 500 companies are greater than $75 billion market cap, dividend yield of 3% or greater, 2014-2016 dividend growth rate of 5% or greater. The midstream peers are Williams Companies, Inc. and Enterprise Products Partners L.P.
High Yield Case (4.8% Yield): Consist of 44 publicly traded MLP companies representing a cross section of the industry including large cap diversified, natural gas pipeline, refined product pipeline, gathering and processing, general partners, and others with an average 4.8% most recent quarter annualized distribution yield. The Base Case (4.2% Yield): The average of the low yield and high yield cases. The three cases show attractive returns over the three and five year investment time frames. The Base Case could produce an estimated 26-27% annual return, a $58-70/share price to be realized in the 3-5 year investment horizon. 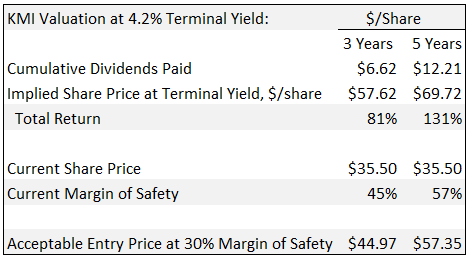 We also get paid a nice dividend while waiting with raises along the way that will provide an 8.3% yield in 5 years on our cost today at $35.50/share. Consider too, the valuation on a yield basis considers growth only to the extent management has factored that growth into the dividend guidance. To that extent it could be conservative if you recall management explicitly stated that the dividend growth “is before taking into account a larger opportunity set driven by a lower cost of capital”. The new Kinder Morgan is invested in real infrastructure assets that appreciate over time; with attractive investment characteristics; in an industry facing unprecedented growth; one supplying essential goods and services to society; a company with shareholder friendly management; proven performance; and stable cash flows. A savings of $20 billion in taxes over the next 14 years from the depreciation as a result of the merger. A dividend increase of 16% in 2015 and guidance for an additional 10% per year for the 2015-2020 period. Reduced cost of capital providing the flexibility for KMI to participate in the rapidly growing oil and gas infrastructure needs driven by the unconventional oil and gas activity. As the largest midstream infrastructure company, KMI’s large footprint, will likely provide more opportunity for internal growth investment as locations, right of ways, service capabilities become increasingly important for growth opportunities. Currently $17 billion of identified organic growth projects at KMI and an estimated $530-690 billion of additional industry investments needed over the next decade increases industry’s capitalization 60-80% and a pipeline of future investment and acquisition opportunities. The valuation considers this growth only to the extent management factored that growth into the dividend guidance. Recall management explicitly stated that the dividend growth “is before taking into account a larger opportunity set driven by a lower cost of capital”. Kinder Morgan’s growth from a $40 million initial investment to become the with a $140 billion enterprise value providing solid total returns over the years and attesting to management’s capital allocation skills. Management’s interests are aligned with shareholders; Chairman and CEO Rich Kinder along with other management and the original stockholders own about 29% of KMI stock. It is likely that the KMI share price will respond negatively to a rising interest rate cycle although the estimated future distribution growth could help insulate the company from interest rate risk longer term. KMI’s ability to support distribution increases is dependent on growth. The risk is mitigated with $17 billion of identified projects and a strong forecasted industry growth but it requires access to favorable capital markets for finance and equity issuance. KMI offers investors limited commodity price volatility through the toll road business model. However, lower commodity prices overtime could result in oil and gas production creating volumetric risks through reduced throughput in the gathering systems and pipelines and reduced cash flow. Although a risk, it is not believed to be material. KMI’s leverage is relatively high; The Debt/EBITDA (Earnings before Interest Tax Depreciation and Amortization) ratio is estimated at 5.6X in 2015 and they have a target range of 5.0-5.5X. This is offset somewhat because the cost of debt is lower than the cost of equity and the company said the rating agencies indicated the company will maintain its investment grade rating; still additional leverage increases risk. KMI is subject to various regulatory jurisdictions and changes in regulations such at the FERC, PHMSA or the EPA could adversely affect the business. The overall health of the economy is a factor as energy consumption tracks overall economic activity levels. Increases in energy consumption will lead to higher midstream activity but a decrease due to economic health will lead to a decrease were it to occur. The North American oil & gas renaissance is creating a unique opportunity to invest in midstream infrastructure companies with strong growth prospects not seen in decades. Kinder Morgan’s large foot print of assets are nearly impossible to duplicate and provide advantages that are not available to new entrants and smaller operators. As macroeconomic conditions continue to create uncertainty they are also providing an opportunity for long term shareholders to acquire KMI’s long life real assets, with near monopoly status, at a good value. Disclosures: I am long KMI and will be buy more shares in the near future. You are encouraged to do your own independent research (due diligence) on any idea discussed here because it could be wrong. This is not an invitation to buy or sell any particular security and at best it is an educated guess as to what a security or the markets may do. This is not intended as investment advice, it is just an opinion. Consult a reputable professional to get personal advice that meets your specialized needs of which that the author has no knowledge. This communication does not provide complete information regarding its subject matter, and no investor should take any investment action based on this information.